The Nouveau package is our premium option for the couple who wants the best of the best. A classic but extravagant ceremony that will make your 'i do's' even more special. 1 x Extra Large Ceremony Arch with white drapery secured with white ribbon and seasonal white blooms. 1 x Crystal Chandelier hung in the centre of the arch. 1 x Signage table with two white Tiffany Chairs and white tablecloth with a vase of fresh white seasonal blooms. 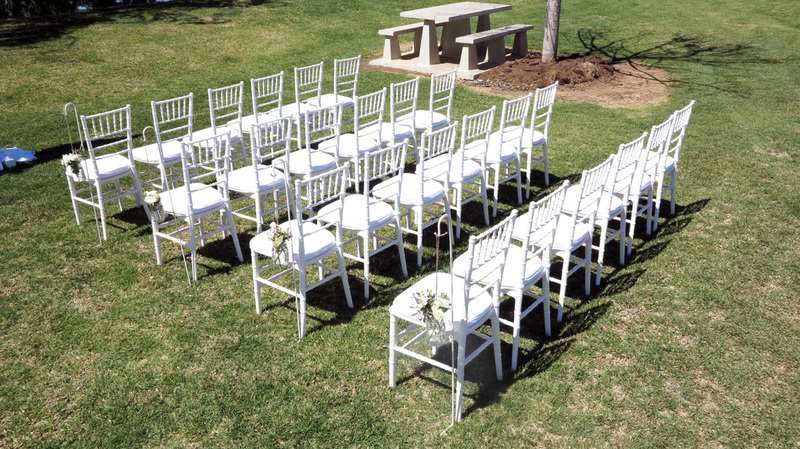 48 x White Tiffany Chairs. 8 x White Shepherds hooks with a choice of hanging Mason Jars OR Glass Terrariums filled with white seasonal blooms. Kylie & Mitch at Tangaratta Vineyards with the Nouveau package.